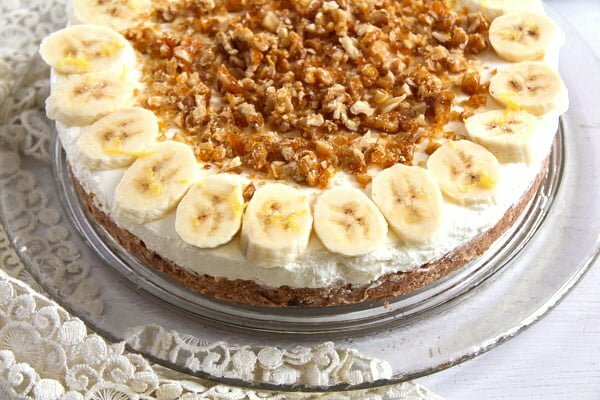 My favorite banana cream pie, a no bake dessert with bananas, caramel, candied walnuts and a delicious cream cheese, yogurt and heavy cream filling. 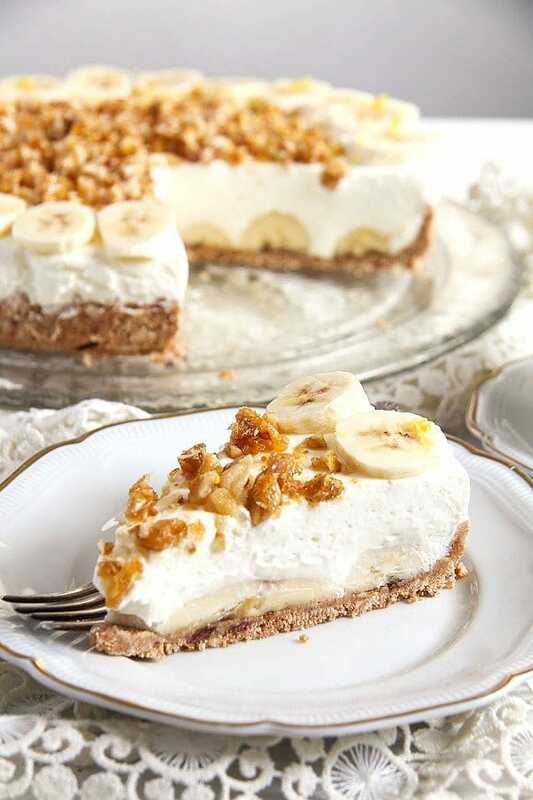 This No Bake Banana Caramel Cream Pie with Candied Walnuts is addictive! Really! If you had it once, you will keep making it again and again. And you will get tired of writing down the recipe for all the people who will ask for it. 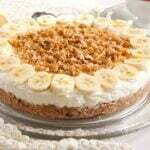 I’ve made this banana cream pie for the first time many years ago for my mother-in-law’s birthday. I wanted something particularly sweet for her major sweet tooth, hence the caramel and the bananas, yet something easy, preferably no bake. I already had a lot of work to do with the other cake I was making for her and which was a fondant decorated cake, so I thought that the second cake should be something simple that did not involve so much work. 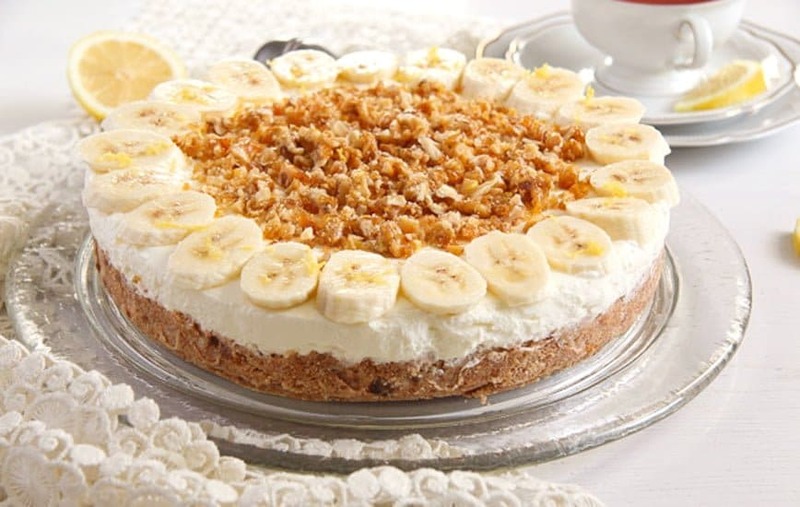 So, I chose this No Bake Banana Caramel Cream Pie with Candied Walnuts. And I must say, that although all the guests admired the elaborate fondant cake very much, they all said that the banana cream pie was their favorite. 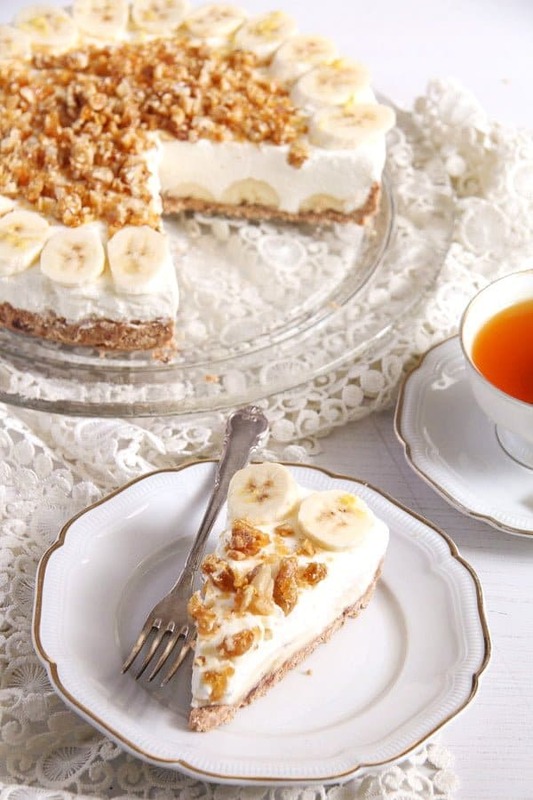 Ever since, I’ve kept making this banana pie with cream cheese and walnuts again and again and it never disappointed. It is just amazing! I have a weakness for no bake cheesecakes or, in this case, pie. You might have noticed that already, I have quite a few no bake cream cheese/ yogurt/ buttermilk/ etc cheesecakes on Where Is My Spoon. Sometimes they are a pure no bake affair, meaning that the crust is also a no bake kind of crust made with butter biscuits or similar products (see the Creamy White Chocolate Apricot Cheesecake or the No Bake Blueberry Lemon Curd Cheesecake with Mascarpone). Sometimes I combine a baked base with a no bake cheese filling (see yesterday’s Passion Fruit or Maracuya Juice Cheesecake with Quark and Cream or the Strawberry Cheesecake with Cream Cheese and Yogurt Filling). or a similar product to make the pie crust for the banana cream pie. I like these biscuits, they are crunchy and light and sweet enough to use in a pie. I have tried to use other kind of biscuits to make pie crusts over the years, but to tell you the truth, nothing ever worked as well as these biscuits, the biggest issue being the crust thoroughly sticking to the springform. That never happened with these butter biscuits, so I stick to them. Not to mention that they are always the cheapest alternative as well. For a special flavor I sometimes mix them with amarettini or other spicier biscuits/cookies, but most of the times, the no bake crusts I make are a simple affair, a mixture of these nice biscuits and some melted butter.
. For detailed instructions on working with gelatin, have a look at this post No Bake Ricotta Sour Cream Cheesecake with Raspberries.
. However, pecan nuts are not so readily available in Germany and when they are, they are very expensive, so I replace them with walnuts most of the times, I like walnuts better anyway, and although they are not exactly cheap either, they still cost less than pecan nuts. 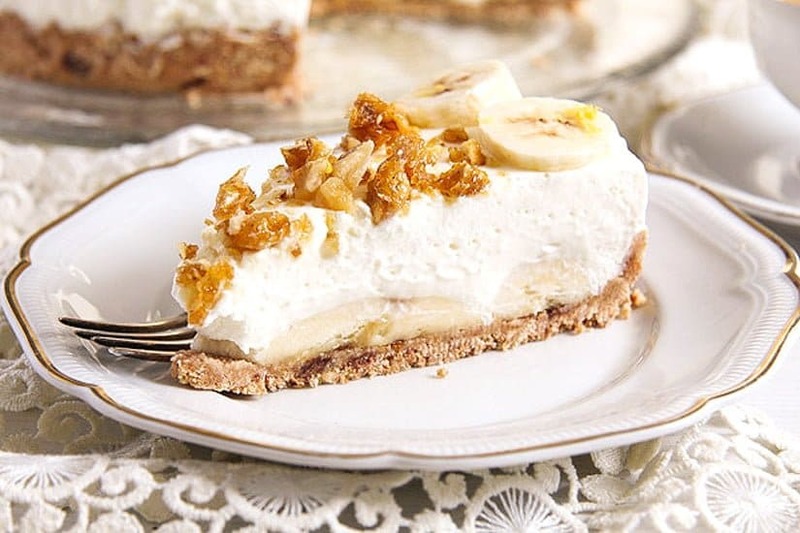 The filling for the No Bake Banana Caramel Cream Pie with Candied Walnuts is a mixture of cream cheese, creamy yogurt and whipped heavy/double cream. Make sure to use pure and good, unsweetened cream for the filling, it makes all the difference. We are used with using overripe bananas in cakes or desserts. However, in this case, you should choose ripe yet still firm, yellow bananas. Leave the overripe bananas for some delicious banana bread like this Vegan Banana Bread. into smaller pieces and give them to a food processor. Process until they resemble breadcrumbs. Alternatively give the biscuits pieces to a freezer bag and crush them finely with a large rolling pin. Melt the butter in a small saucepan, give the butter to the crushed biscuits and mix together. Press the mixture into a buttered springform of about 24-26 cm/ 9.5-10 inches diameter. Refrigerate while you make the filling. , see this post: No Bake Ricotta Sour Cream Cheesecake with Raspberries. Give the sugar and the milk to a small saucepan. Heat while stirring until the sugar is dissolved. Bring to a boil and stir until the mixture thickens slightly. Remove from the heat and let cool slightly. Squeeze the bloomed gelatin slightly and stir it thoroughly into the sugar mixture. Give the cream cheese and yogurt to a bowl. Mix well and add the caramelized sugar. Place the filling into the fridge until it begins to set. It should only begin to set, not set entirely. In the meantime beat the double/heavy cream until stiff. Fold it carefully into the cream cheese mixture. Halve 3 bananas lengthwise. Place the banana pieces onto the pie crust. Carefully pour the cream cheese filling over the bananas. Refrigerate the cake for at least 3-4 hours or overnight. In the meantime make the candied walnuts and leave them cool completely on a piece of baking paper until ready to use. Heat a non-stick pan over medium heat. Add the sugar and the butter. When the sugar and the butter start to melt, add the chopped walnuts and stir well to coat them with the butter-sugar mixture all over. Keep stirring for about 3-4 minutes or until the walnuts are nicely caramelized. Give the walnuts onto a piece of baking paper. Separate slightly so that the walnuts don't stick together into a clump, but rather in a single layer or as separated as possible. Let cool completely. Only give the candied walnuts and the last banana on top of the pie just before serving. Slice the remaining banana and turn the slices into the lemon juice. 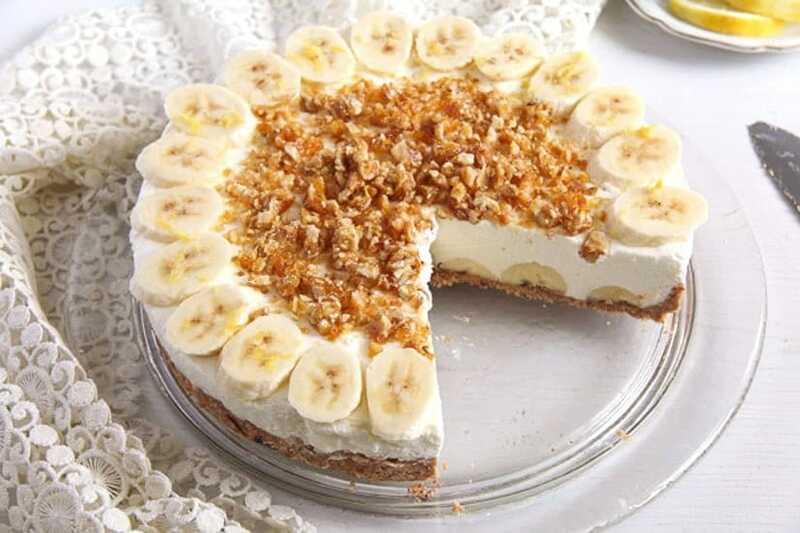 Arrange the banana slices around the edges of the pie. Chop the candied walnuts and give them on top of the cake inside the circle you formed with the banana slices. Decorate the cake with some lemon zest as well, if desired. So beautiful! You are right: it’s for people with a particularly sweet tooth, such as my husband! If I made your passion fruit cake and this one, we would both have our dream cakes! The filling should work great without the gelatin too, if you are looking for a vegetarian alternative. I like banoffee kind of pies and this one sounds really great. Love the decor too. i LOVE banana cream pie! the candied walnuts are a wonderful touch and something i fully intend to try! You’ve hit another one out of the park, Adina! This is a gorgeous pie and I’m going to have to think of an excuse to make one soon! I know it will be a complete hit!